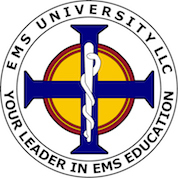 Arizona EMT Classes | EMS University, LLC - "We don't follow the standards... We set them!" Fast Track EMT Classes - Become an EMT in 16 Class Days! (Externship hours also required). Become an EMT. EMS University, LLC seeks to produce the highest quality EMTs in Arizona. Our highly selective program is designed to prepare the student for success both for the National Registry of EMTs (NREMT) and in the field of EMS in general. We are certified by the Arizona Department of Health Services, Bureau of (Emergency Medical Services) EMS to offer EMT classes. Below you will find information about our program and how to sign up to become an EMT.